Garage Sale Trail is celebrating some of the amazing Australians that are trailblazing in the sustainability, ethical fashion and zero-waste spaces. These innovators are contributing to global movements, from changing perceptions in the fashion industry (the 2nd largest contributor to global pollution) to educating Australians on living a sustainable lifestyle, or making a hand-on difference in their local community. Basically, they are being absolute heroes! As part of this campaign, we’ve photographed these sustainability superstars in our “Trail Blazers”, designed and made by the immensely talented Julie Paterson and Chrissie Powell. Together, these creatively gifted and thrifty women are the hands behind our funky series of blazers, made out of reclaimed materials, which have now travelled all over the country in the name of reuse! 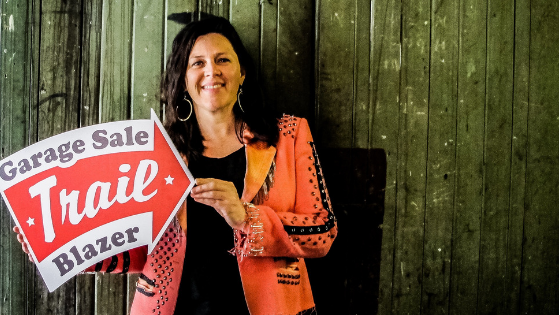 Julie Patterson, who designed each of the Trail Blazers, is the force behind ScrapClothFabric, a small fabric company encouraging others to buy and produce sustainably sourced, hand-made textiles. She runs what she calls “imperfect workshops” for the creatively curious, teaching how to embrace imperfection and focus on process. She has even created and launched her first book, Clothbound. Chrissie Powell, otherwise known as The Halcyon Fox, collaborated on this project as the maker and creator of Julie’s designs. 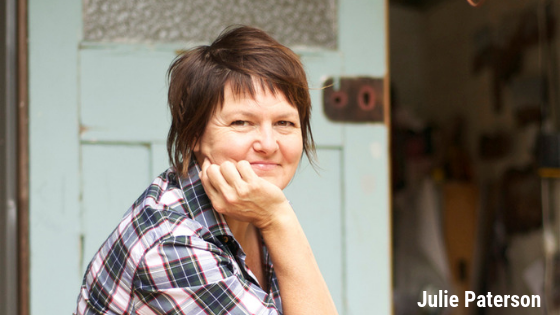 Julie is a marvel of textile design and often exhibits her badass, larger-than-life creations. Her colourful, custom pieces are loved by those that appreciate one-of-a-kind handmade textiles. 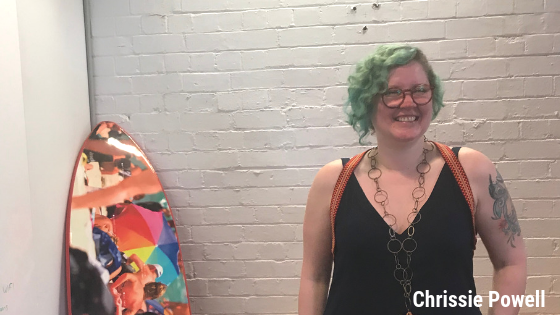 With their commitment to the artistic process, and creating individual pieces by hand, both Julie and Chrissie are fighting the good fight against fast fashion. Nice one! One of the Trail Blazers Julie & Chrissie created was the fabulous “Jean Jeanie” blazer for Clare Press, Sustainability Editor-at-Large for Vogue Australia (yes, Vogue!). 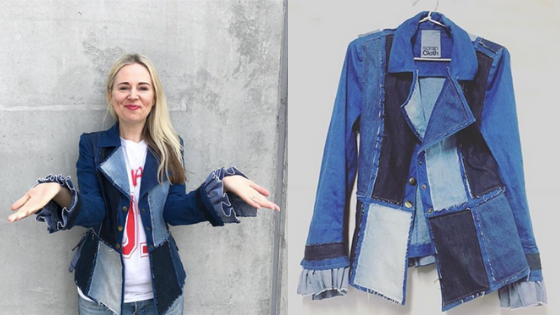 Using an upcycled denim op-shop blazer, three pairs of old jeans, and a few additional scraps, it’s described as “part seventies funk, part new romantic, 100% sustainable realness” … and we are in love! The God Save the Queen design has been worn by the likes of Mel Tually of Fashion Revolution Australia (seen below) as well as Deputy Lord Mayor of Sydney, Jess Miller. Julie designed this one with a vision of zips, safety pins and whatever she could get her hands on! As Julie says, “creativity becomes a skill, but it starts as an attitude”.